Saumu Mbuvi this past weekend turned a year older and to mark this special occasion; her boyfriend went to give her nothing but the best. Well, word has it that the lit party went down at Club Wakanda where only friends of the couple were invited. Judging from the decorations seems that this was a pink and purple themed party and and Saumu Mbuvi wouldn’t have wanted it any other way! Perfect match This party however comes just a few weeks after Saumu threw her man the most perfect birthday party. She went on to celebrate him through her Instagram page where she went on to write saying; “With you by my side, I feel very safe and ready to take on any challenge or obstacle. You are an amazing teammate, and I love you for that. Happy birthday, my love,” And now in return the young man treated his wifey to this perfect party. Checkout the photos below. 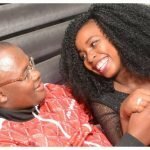 The post Photos from Saumu Mbuvi’s lit birthday party thrown by her wealthy boyfriend appeared first on Ghafla! Kenya.